Step by Step Deco Mesh Christmas Wreath Tutorial! 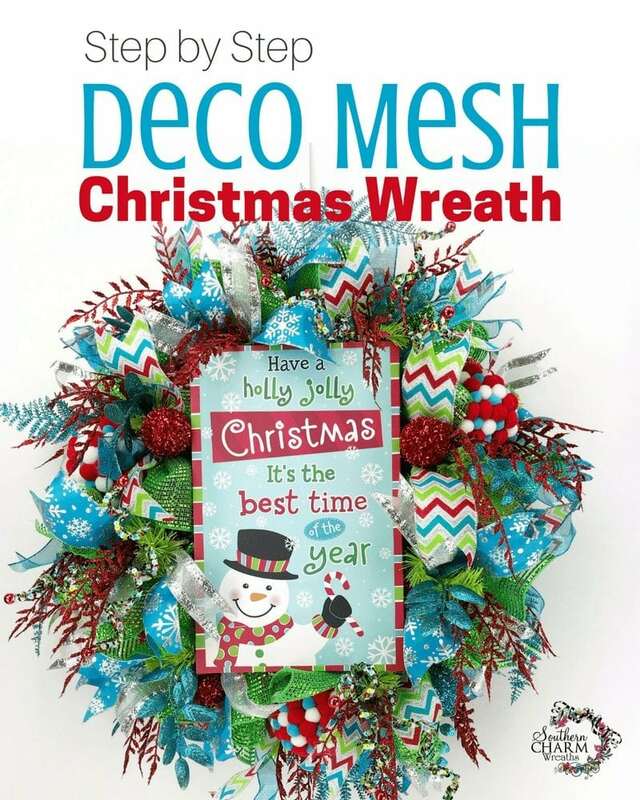 The Deco Mesh work wreath form comes with the ties on it already! How easy! 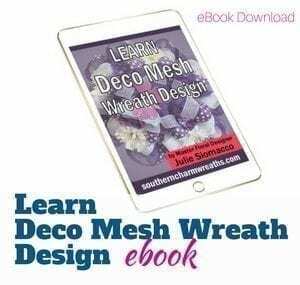 Start by measuring out 4 inches of the deco mesh and attach it using one set of the ties on the inner ring of the wreath form. Note: Do not cut the mesh. You are going to continue measuring and attaching as you go around. Next, measure out 10 inches and attach to next set of wreath ties on the inner ring. Do not pull tight, you want to gather it at each set of ties so you have a bit of a puff of the mesh. Continue measuring out 10 inches and attaching all the way around. When you finish going all the way around the inner ring, cut off the remaining mesh. Note: For my wreath, I used one roll of Deco Mesh for this inner circle. Next, do the same process for the ties in the outer ring. Cut off any excess mesh. To prep for the next step, cut sections of the 10 inch Deco Mesh. I used green metallic mesh for this wreath. Using scissors or a rotary cutter, cut 10″ sections of the mesh. You’ll also need 9 strips of each ribbon, 14 inches long each. I used ribbons that were 1.5 inches wide and 2.5 inches wide (9 strips of each). Layer one piece of the 10 inch Deco Mesh and a strip of two ribbons. Gather them in the center and attach to each set of wreath ties. Continue until you have attached a bundle to each set of ties. 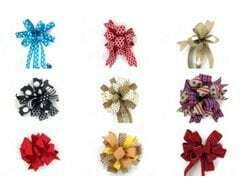 Once the bundle is attached, arrange ribbon pieces in an “x” shape. Note: I use a Bowdabra to hold the bundles while I work. I also alternated ribbons so the ribbons were not the same in every bundle. To prepare your sign, staple two pipe cleaners to the back for easy attachment. Note: I like to add a bit of hot glue over the staples to ensure it stays. Set sign aside. Now attach the sign to the center of your wreath using the pipe cleaners you attached. Attach it to the wreath frame and trim off excess pipe cleaner stems on the back of the wreath. Work through your wreath ensuring everything is fluffed up and the ribbons are arranged the way you like. To add the pompom ornament balls to your wreath, use an awl to make a hole through the middle of each ornament. Then push a pipe cleaner through the hole and attach to the wreath using the pipe cleaner. For even more dimension, add assorted Christmas picks throughout the wreath. I used blue & red metallic leaves, silver metallic sprigs and red, blue & green metallic balls. Now step back and admire your creation! So what do you think, are you ready to try your first Deco Mesh wreath? I promise, if you can open and close a twist tie you can do this! Pin this project to refer back to it later. I love this wreath. I tried to find the pom pom ornaments on Trendy Tree but could not find them. Can you tell me where they are located on their web site or the name I should search for? I’ve tried several combinations but nothing is bring them up. 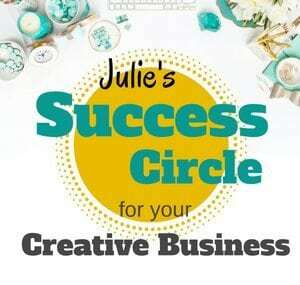 Thanks Julie for this wonderful Christmas wreath tutorial. Always so good to hear from you with a new project. Thank you so much for sharing this tutorial! The video was especially helpful. I had never before made a deco mesh wreath, but I was able to follow your instructions to create a beautiful Christmas wreath for my front door. It is HUGE and lush, and gorgeous! I don’t know if my work wreath had more ties than yours, but I had to cut about 6 more pairs of ribbons in order to have enough for all the ties. For my next wreath, I will order the mesh from Trendy Tree, because you are right about the stuff from my local big-name craft store shedding badly. I wish I could share a picture of my finished wreath – I couldn’t have done it without this VERY THOROUGH tutorial! Beautiful! 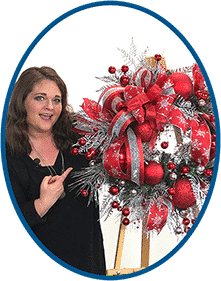 Julie, is all the ribbon in this wreath wired?